I saw two identical gas stations of the same brand on Highway 50 in Kenosha last weekend - I guess they reasoned they had enough customers traveling in both directions that the two stations wouldn't cannibalize each other. I drive by these every day. They are in Pleasant Prairie (just south of the Kenosha border) at the intersection of Highway 50 and County Highway H. There had been a PDQ store on the northwest corner for a number of years. Kwik Trip built a store on the southwest corner a few years ago, and then in 2017 Kwik Trip bought all of the PDQ stores. So now there are Kwip Trip Stores on both sides of Highway 50 on opposite corners, and they both seem to be pretty busy. Google Streetview is from July 2017 when the northwest corner was still PDQ. Yes, that was it! Kwik Trip, not to be confused with QuikTrip. I recall there was an intersection in Salt Lake City which featured two Sinclair stations right across the road from each other, at M Street and South Temple Here's a GSV of one: turn 180 degrees and you'll see the other. The funny thing is that neither is left today. One became a Smith's Express, while the other was completely torn down; that lot is now occupied by the Ronald McDonald House. Honorable mention: Fair Oaks Mall in Fairfax has two Macy’s stores (Macyses?). You can’t see one from the other, but two of the same department store in the same mall feels like it fits the spirit of this thread. Dillard's is perhaps the king of this. They have double-headers, and even a few triple-headers anchoring some malls, many within view of each other. Granted, one is typically the Men's and Home Store, while the other is the Women's and Children's Store. Volusia Mall, Daytona Beach, Florida. How many places can you think of where you can see two (or more!) of the same business? At ground level. One of the first places that comes to mind is probably McDonald's, since they're like, everywhere. Many roadgeeks can likely think of a location where you can spot two high-mast signs between freeway exits. At one time, at the I-70/I-75 interchange, it was possible to see arches at the Vandalia exit to the north, and the Huber Heights exit to the east; not sure if you still can due to tree growth and construction. A puzzling example is in Severna Park, MD, where there are two McD's on opposite sides of Ritchie Highway (MD-2) and less than a mile downfield. One is actually on Baltimore-Annapolis Rd (MD-648), but just about at the corner. This can sometimes happen with gas stations. In Rockville, MD, there are two Shell stations almost right across MD-355 (Rockville Pike) from each other. There used to be a third Shell directly across sidestreet Rollins Ave. from the northernmost one, but that was demolished and replaced with stores. In New Jersey, there were two Exxon stations on opposite sides of Route 33 near the turnpike. Both were around since Esso days. One was in the gore area where Monmouth St. used to branch off and has been gone for some time (possibly due to the construction of NJ-133). The other was at the corner of Milford Rd., and was only demolished recently -- specifically to make way for the relocation of Interchange 8 on the pike. One of the Shrek movies parodied this with Starbucks. When there was some disturbance, all the customers ran screaming out of one "Farbucks" shop, and race into another one right across the street. I'm not sure that I've seen this, though; what I have noticed is multiple stores in close proximity that sell Starbucks coffee and have exterior signs indicating such, but only one, if any, is a dedicated Starbucks. In San Luis Obispo, CA, just after Motel 6 bought an old HoJos, there were two Motel 6s at the Los Osos Valley Road exit, both on the west side of US-101. I don't know if they both still exist or have merged into one property subsequently (they were a few hundred meters apart). I forget the exit on I-80 in Contra Costa county, but there are McDonald's restaurants on each side of the freeway. My geographically challenged ex- would often require multiple phone calls to arrange meetings there. Taco Bell at one point had no fewer than 4 locations on Folsom Blvd in Sacramento County, but none was visible from the others. They're 800 meters apart, just as you described. Here is GSV of the northern one from the Los Osos Valley Road overpass. The sign is blurry because I've zoomed in, but you can make it out. And here is GSV of the southern one from the exact same spot on the overpass. There used to be two Dunkin Donuts' right down the street from each other (about 1/4 mile apart) in *this location*, until one closed a few years ago. Since then, they've opened up a new location about 3 miles away from the old location. That's rare and surprising; in most cases where that happened (I'm assuming Fair Oaks used to have a Macy's and a Hecht's, and one is a former Hecht's), Macy's would close one of the two stores. You’re correct, one of them was Hecht’s and when Macy’s took over, they decided they preferred to maintain two stores rather than allowing a competitor to take over the space. Once upon a time there was talk of Nordstrom coming to Fair Oaks, so I can see why Macy’s didn’t want that. Another place with two Motel 6's within a stone's throw of one another is in Billings, Montana, at 5353 and 5400 Midland Road. There are two Macy's stores in Lakeside Mall in Sterling Heights, MI. Crowley's, a Detroit-area department store chain, closed down a few years ago and the former Hudson's/Marshall Field's store expanded into the old Crowley's space; Federated kept this arrangement after the Macy's conversion. It carries the men's clothing and housewares departments. That's the same as Fair Oaks Mall pretty much. They just have some departments in one store and other departments in the other store. In Taipei, convenience stores are really plentiful. Same story in Japan. Even more bewildering, there are vending machines outside convenience stores. Most of these examples are in different areas of the mall (the mall is divided into the Court and the Plaza, so one store in each area), but some of these are literally a floor above/below each other. Two of the Auntie Anne's locations are essentially separated by a short walk and a turn down the hallway. I want to say the Gamestops are visible from each other, but I'll need someone to check me on that. Malls are good places to search for duplicated things. I know one mall in Zaragoza, Spain where there are three of the same store. There's also one point in that city from where two of the same department store, El Corte Ingles, are visible: https://www.google.es/maps/@41.647795,-0.885528,3a,15y,41.92h,92.6t/data=!3m6!1e1!3m4!1sinOf-yBGJny0asuTjWSuzQ!2e0!7i13312!8i6656 (zoomed in to where one is located right at the center of the pic, turn to the right to see the other). 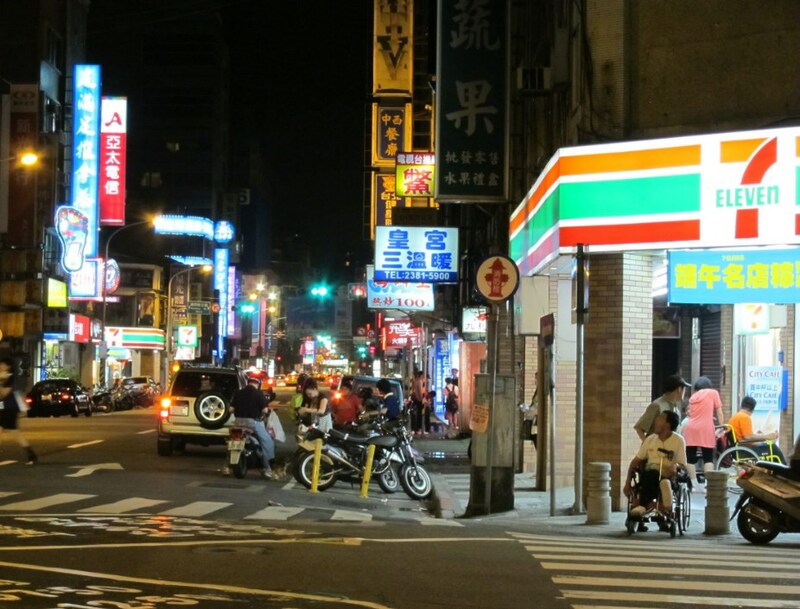 Wow, if I'm correct with the one at the background I count no less than three 7-Elevens in that Taibei street . Mills Fleet-Farm (a chain of large farm/sporting goods/general stuff stores in the upper Great Lakes region) has two gas stations/C-stores across Wisconsin Ave from each other in front of their store on W Wisconsin Ave (WI 96) here in the Appleton, WI area. Their main store is in the background behind the C-store on the right. It just occurred to me that it's fairly common in Mexico for there to be one Pemex gas station on each side of the highway. Here is an example I've actually stopped at a couple of times in Sabinas, Coah. I also saw something like that along an A-road near Milton Keynes in England. And, of course, there are all of those toll road service plazas in the US that consist of two identical complexes on either side of the road. I'd love to know how often that sign gantry gets nailed at this location. Has anyone yet mentioned the two Hess stations that were sited across the street from each other adjacent to the former Hess Corporation headquarters? It appears they’ve continued on as twin Speedways. A similar example to the twin Sunocos at a few PA Turnpike plazas (already mentioned)—North/South Midway, North/South Somerset, and formerly North/South Neshaminy. I don’t believe that the food service offerings are or were the same at any of those pairs...until you go back to Howard Johnson days. and turn 180 degress backwards and click forwards two times and you see motel 6 blackstone south. these have been operating since the 90s or 80s i cant remember! on the road again just can't wait to get on the road again because Life is a Highway and i want to ride it all night long. if you're going my way i want to drive it all night long. here are two chevrons on the other side of the street a block away from each other. Those are not a block away from each other. They are one exit away from each other, ¾ mile apart. Last time I went to downtown San Francisco I was struck by the density of Walgreens and Starbucks locations. Still, I think the winner has to go to the intersection of Sepulveda and Drollinger Way in Los Angeles. If you spin in a circle you'll see THREE separate Starbucks locations: two standalone and a third inside the Ralphs Supermarket. Chicago is probably the most dense city for Walgreens of course it's their home market same with Starbucks in Seattle.